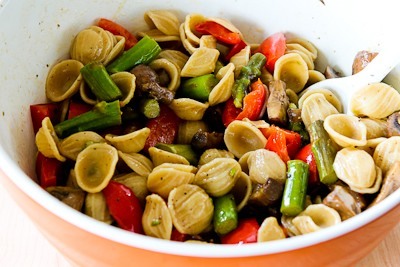 Whole Wheat Orecchiette Pasta Salad with Roasted Asparagus, Red Bell Pepper, and Mushrooms is a perfect salad for Meatless Monday. And this low-glycemic pasta salad is healthier and tastier than lots of pasta salad options you might see. Use the Recipes-by-Diet-Type Index to find more recipes like this one. 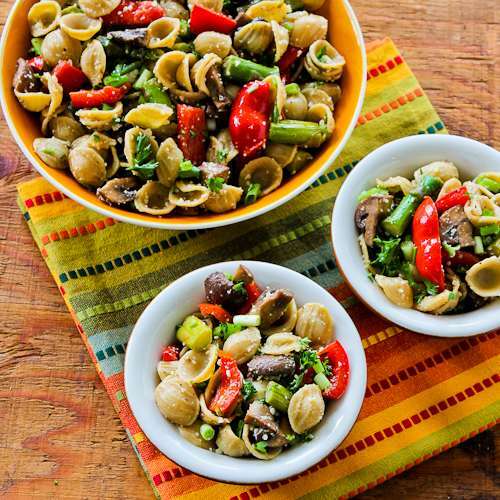 Click here to PIN this Whole Wheat Vegetarian Pasta Salad! Today the temperature in Utah is supposed to get above 90F so we’ve definitely entered the season for warm-weather eating, and lately I’ve had pasta salad on my mind. It seems like there are a lot of ho-hum combinations that give pasta salad a bad name, but I like the challenge of coming up with something that’s really good, and I loved the Whole Wheat Spaghetti Salad I made recently. 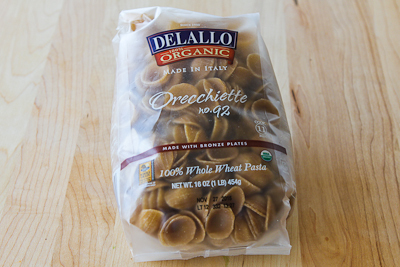 Then I excitedly discovered Delallo Organic Whole Wheat Orcchiette at the store in my new town, and my mind started spinning with thoughts of making a really drool-worthy vegetarian pasta salad. 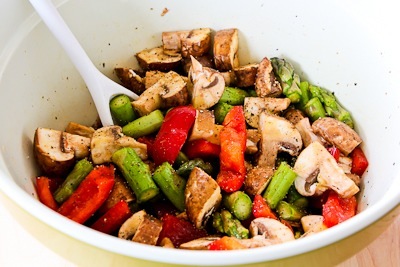 This Whole Wheat Pasta Salad with Roasted Asparagus, Red Bell Pepper, and Mushrooms has wonderful flavors from roasting the vegetables, and then I added this fun pasta shape, sliced green onion, chopped parsley, kicked-up Italian dressing and coarsely grated Parmesan to make a truly fantastic salad. Pasta salad is often served as a side dish, but I’d love a salad like this for a Meatless Monday lunch or dinner when the weather is hot. Click here to see all the Meatless Recipes. 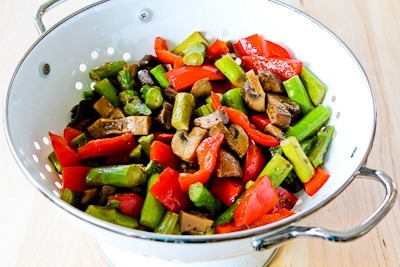 Cut the asparagus, mushrooms, and red bell pepper into pieces that are similar size and shape and toss together in a bowl the olive oil, salt, and fresh ground black pepper. Here’s how the veggies look when they’re roasted. Let the vegetables cool for about 4-5 minutes, then dump them in a colander and let the excess liquid drain off. (Don’t skip this step or the salad will be watery. While they drain, mix together bottled Italian dressing, Spike Seasoning, and black pepper to make the dressing. Once the vegetables have drained, put them in a bowl and toss with 3-4 T of the dressing mixture. 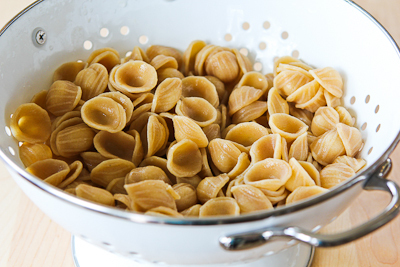 Here’s the pasta I found that inspired the salad, but if you can use any smallish whole wheat pasta shape, (and here’s how to pronounce Orecchiette). Cook the pasta according to package directions until it’s al denta, drain, and rinse with COLD water. Then let pasta drain well, stirring a few times so it doesn’t stick together. When the pasta is cooled and well-drained, mix it into the marinated vegetables and toss with the rest of the dressing. Add freshly grated Parmesan and toss again. Serve slightly chilled or at room temperature. Preheat oven to 400F/200C. Break a piece of asparagus to see where the woody part starts, then trim all the asparagus to that size and cut into 1 inch pieces. Cut out stem and remove seeds from red bell pepper, and cut into strips about 1 inch long. Wash mushrooms if needed and cut into thick slices (or half-slices if the mushrooms are large.) 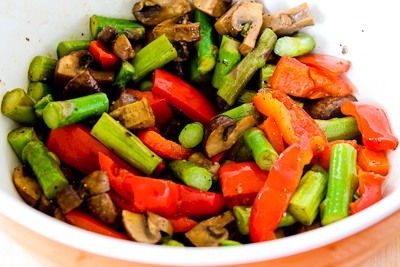 Put the prepared vegetables into a bowl and toss with 2 T olive oil; season with salt and fresh ground pepper to taste. 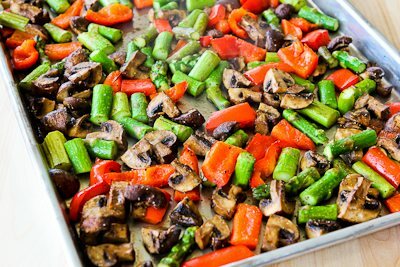 Spray or brush baking sheet with olive oil or nonstick spray and arrange vegetables in a single layer. (Next time I’d use 2 pans if the vegetables look crowded.) Roast vegetables 15-20 minutes, or until they’re starting to shrivel but not completely soft. While vegetables are roasting, fill a medium-sized pot with water, add about 1 tsp. of salt, and bring to a boil. 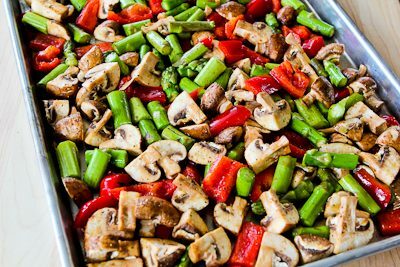 Remove vegetables from the oven and cool on the baking sheet 4-5 minutes. While vegetables cool, whisk together the salad dressing, Spike Seasoning and coarse ground pepper. Chop the parsley and slice the green onions. When the roasted vegetables are partly cooled, put them in a colander placed in the sink and let them drain until any excess liquid runs off. (Don’t skip this step or the salad will be watery.) After vegetables drain, put them back in the same bowl and toss with 3-4 T of the dressing mixture and let vegetables marinate. When pasta water is boiling, add the pasta, stir, and reduce heat to a low boil. Cook until the pasta is barely al dente (check package cooking time.) Drain pasta into a colander placed in the sink and rinse with COLD water, and then let drain well, stirring a few times so it won’t stick together. When the pasta is well-drained, add it to the marinated vegetables, mix in the rest of the dressing, chopped parsley, and sliced green onions, and gently stir to combine. Add the freshly-grated Parmesan, stir again, and serve salad slightly chilled or at room temperature. This was still quite good after it had been in the fridge overnight, although pasta salad like this is best freshly made. Using a moderate amount of whole wheat pasta and lots of low-glycemic roasted vegetables makes this salad a good choice for Phase 2 or 3 of the South Beach Diet or other low-glycemic diet plans. Obviously this is too high in carbs for traditional low-carb eating plans. I wanted a quick lunch recipe that would use up mushrooms and peppers before we left on a trip tomorrow. I served the roasted veggies in pitas with lettuce, it was delicious! Pamela, that sound good to me; so glad you enjoyed it! Chelsea, so glad you enjoyed it! I agree, using two pans is a great idea. I've made this pasta salad twice, and it was delicious both times! The first time I used one pan to roast the veggies (as you did) and I had a lot of liquid to drain, but the second time I spread the veggies out more onto two pans and there was little to no liquid to drain! Just thought I'd share. VeggieGirl, so glad you like it! This sounds awesome!!! I love ALL of these veggies :). Thanks Barbara, and really delicious too! What a great way to get more veggies in your diet. Maria, I was SO, so excited when I found that pasta at the main grocery store in my new town. Only another food blogger could understand that feeling! I love all of the veggies and that is my favorite pasta! I hate mayo so any kind of pasta salad that doesn't include it sounds good to me! Love all the veggies in this!